Traits and Emotions of a Salvageable Soul helps one achieve a higher quality of life by realizing one’s own value. What was the inspiration that made you want to put your wisdom into a book? The inspiration for writing this book came from God’s whisper. Although I have a beautiful heart, my walk in life hasn’t been so great. I love giving to other people, regardless of the color of their skin. One day I was reflecting on all the books that I’ve read and noticed that none of them spoke to my soul. I was looking for a touch of guidance and in doing so, I thought it would be a good deed to provide our youth with a book of wisdom. Now no one can say they were never informed. This book covers many different topics from happiness to accepting criticism. What were some themes you felt were important to express in this book? I thought it was important to express: Accepting constructive criticism, the importance of respecting our elders, appreciating and respecting woman and all of the other themes. 🙂 I can honestly say that this book is what my heart needed to express. Why do you think some people struggle with finding value in themselves and in their lives? 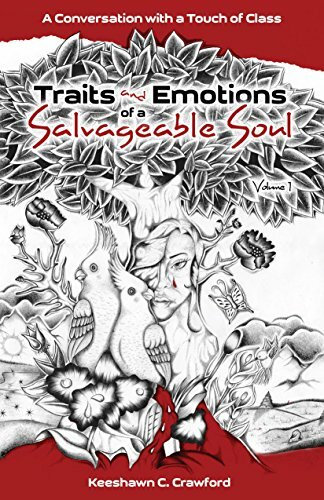 My next book will be, Traits and Emotions of A Salvageable Soul, Vol. II. Truthfully, it’s already completed. In case you weren’t aware, $1.00 from every book purchased goes to St. Jude’s Children Hospital. A dollar from my next book will probably go to The Ronald McDonald House. I can’t give away too many details, but I’m working on a deep novel titled, Silenced by a Predator’s Threat. You can look for Vol. II sometime in January or February of 2019. Please, tell the world about this book. Everyone can find me at Inkwater.com or via my Facebook link (below). All people have their own remarkably intrinsic value, and it’s time we recognize it in ourselves and share it with the people in our lives. From the wisdom of elders comes Traits and Emotions of a Salvageable Soul: A Conversation with a Touch of Class, a guide to growing and healing ourselves so that we can live the quality of life we were always meant to live. From life’s hard lessons, Crawford offers the reader encouragement and truth, a path for using life’s challenges to overcome and even thrive. Don’t give up, he reminds us. Every one of us has great potential and purpose. We just need to have faith in ourselves and courage. Traits and Emotions of a Salvageable Soul by Keeshawn C. Crawford is certainly among the most interesting books I had the pleasure of reading this year, if not the best. This piece of non-fiction is an apt example where in the author delves into a personal need of an individual for that special word of inspiration. This book has a clear vision of it’s purpose and direction and was a really good read. The focus of the writer is crisp and smooth. We are observing a world today that is experiencing more and more women raising their voice against violence and sexual aggression of men in power and influence. The first topic thus selected, aptly deals with the intrinsic build up of the common woman, and to take care of herself. The subsequent topics have been laid out in a well-defined manner, starting with happiness, love and the concept of helping. The book further delves into other topics which form an important part of moral principles such as sacrifice, strength in troubled times, empathy, and many others. The author also touches on other equally important topics such as parenting, the ingredients for a well-nourished relationship, and accepting criticism constructively to become better. The author balances this with wise words of caution against weakness, ignorance and greediness. There are many other word gems in this book as well, such as the ones highlighting wisdom of elders, the notion of self-respect, signs of a true friend, just to name a few. I was a bit bewildered at first at how much these moral principles influence, affect and shape our lives, and of those with whom we interact. The author however, seems adept in corralling these principles together with the physical constructs. I feel it important to point out that this book is not meant for speed reading to be just done away in a few days time. The real pearl of this work lies in soaking up the meaning in the words and continuously striving to build a strong mental platform upon which you can work to see your behavior change and be improved by the many areas which the author has pointed out in every chapter. The author fervently impresses upon the reader to conduct oneself in such a manner that would make it more pleasurable for others to follow their lead. This book can be categorized as a self-help book, but it goes beyond and compels you to think and continuously strive to be a better individual and a good citizen. I am already looking forward for the next book from this author.